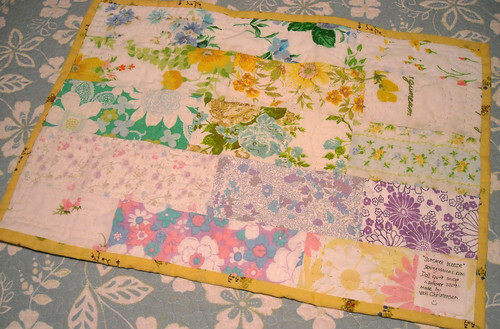 Sew Inspired: mini-quilt monday #2, "summer breeze"
Ohhhhhh, I think I like the back just a little bit more than the front! Looks great! I agree. I really like the back. You'd never know it was made out of vintage linens. Nice job. this is really cute. I love the use of the vintage sheets...they look great. how pretty is that! 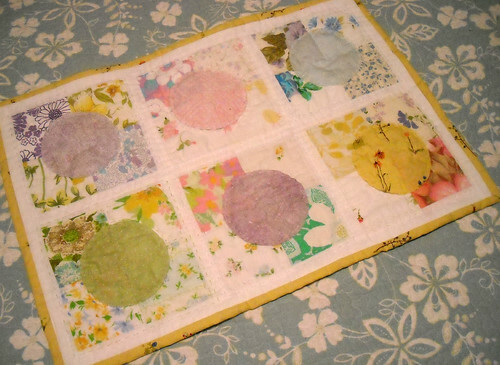 what a great use for little leftovers of vintage sheets! i should be back to normal after next week. maybe we can get together to exchange project improv quilts. This looks so cute and the binding is perfect.